History was made when President Barack Obama was elected the 44th President of the United States of America. I'm the mother of two mixed-race children, so I like to think that this event was ever more important for our family. My children face adversity and racism almost daily. They see the struggles that many African American people endure, and I believe that this historical event showed my children what they can accomplish. 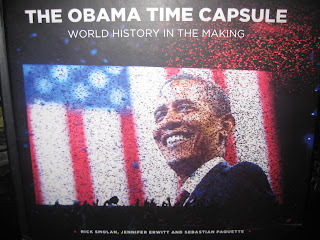 That's why when I was offered to review the book The Obama Time Capsule, I was excited and enthralled. I was excited because this book is a keepsake and I was enthralled because it's a book that spans a two-year time period, covering President Obama's road to the White House, Election Day, the inauguration, and his first 100 days in office. Another reason I was enthralled is that you can personalize this book with your child's name. I chose to use my son's name in this book, since I've watched him endure racism almost daily, and he's overcome so many adversities in his short life. I truly believe that this book can be a great influence in his life, and that with it, he will know that he can truly accomplish anything. The Obama Time Capsule is essentially a customized book that allows you seamlessly add your personal pictures and thoughts to the existing professional photos and essays documenting Obama's journey to the White House. The book contains beautiful photographs and essays and gives users the ability to insert themselves into a piece of history. For some additional insight, please check out the HP commercial on YouTube which provides a great visual of what the book is all about, as well as recent broadcast coverage from ABC Evening News. It's so trite, but kids do grow up so fast. As a mom who is witnessing their incredible growth, I'm always taking photographs and videos to freeze frame the moments in our young children's lives. We are always in pursuit of chronicling their daily existence and in that vein, chronicling the world they were living in at the time. Theirs is the first generation to experience something unprecedented in the history of our country and that is of course, having an African-American President. Regardless of which side of the political table you sit at, there's no doubt that Obama's presidency will have a major impact in our children's futures. On the cover of the book, which you unfortunately can't see in the first photo, my son is listed as one of the authors, which we all thought was so cool! 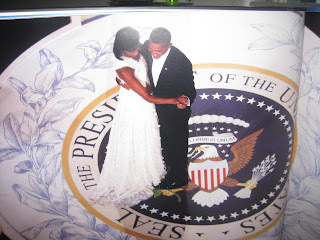 Photo inside the book of The President and The First Lady at just one of their inaugural balls. Aside from the personalization aspect of this book, I love the entire book! There's great quotes from President Obama, as well as many other prominent figures, TONS of facts, and countless great photos. Even though my son is technically the "owner" of this book, I am so proud to have this book in my home. 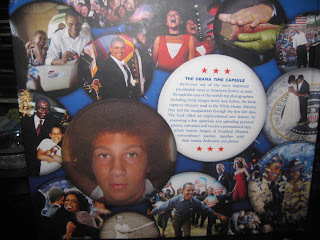 Never in my life did I think that I would see an African-American be elected as President of our great Nation, and now I am the proud owner of The Obama Time Capsule, a great keepsake, with my son listed as an author! We can pass this down from generation to generation and I'm sure that it will stand the test of time due to its quality. The book is excellently made! Thank you to my sponsors for providing me with the opportunity to review this great book! My son and myself will cherish it always! Great review Angie - we love our Time Capsule book too. One of Taylor's favorite parts was the message on the blackberry in the book!